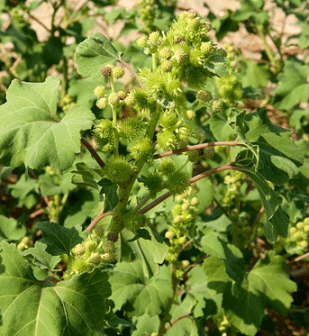 Xanthium strumarium (Chota dhatura) complete detail – updated. 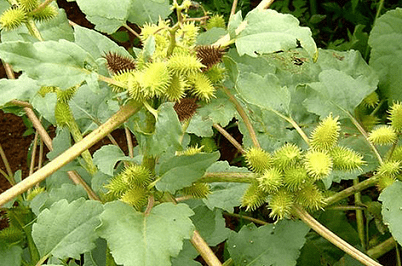 Medicinal Uses of Xanthium strumarium (Chota dhatura). 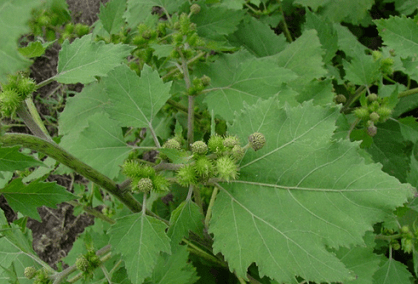 Description of Xanthium strumarium (Chota dhatura) – Common Cocklebur. Classification of Xanthium strumarium (Chota dhatura). Local name of Xanthium strumarium is Common Cocklebur and Chota dhatura. Xanthium strumarium is an annual herb, up to 1 m in height. Xanthium strumarium has stout stems, green, brownish or reddish-brown in color, often red-spotted that are rough and hairy. Fruits are cylindric to ovoid, two-chambered bur, 1 to 4 cm long, glandular, covered with hooked prickles, with two larger, longer incurved prickles projecting from the apex of the bur. A decoction of the root has been used in the treatment of high fevers. The dried leaves of Xanthium strumarium are a source of tannin. It has many medicinal properties like cooling, laxative, fattening, anthelmintic, tonic, digestive, antipyretic, improves appetite, voice, complexion anodyne, Antirheumatic, appetizer, diaphoretic, diuretic, emollient and sedative. Xanthium strumarium is an annual herb, up to 1 m in height. Xanthium strumarium has stout stems, green, brownish or reddish-brown in color, often red-spotted that are rough and hairy. The first true leaves are opposite, all subsequent leaves are alternate. Leaves are triangular to ovate in outline, have stiff hairs, and are approximately 2 to 7 inches long. Leaves are irregularly lobed with leaf margins that have relatively inconspicuous teeth. The flowers are monoecious (individual flowers are either male or female, but both sexes can be found on the same plant) and are pollinated by Insects. The plant is self-fertile. Flower heads occur several to many in short-pediculate axillary or terminal racemes. Plant monoecious, with staminate heads/flowers above the clustered pistil late flowers along the axis. Fruits are cylindric to ovoid, two-chambered bur, 1 to 4 cm long, glandular, covered with hooked prickles, with two larger, longer incurved prickles projecting from the apex of the bur. Brownish to reddish when mature. Seeds are one achene per floret, two per bur, 1 to 1.5 cm long, dark-brown, oblong and flattened with pointed apex. The seeds are dispersed through contaminated farm tools, waste soils and furry farm animals. Xanthium strumarium is distributed worldwide but is most common in the temperate zone. It is a serious weed in Australia, India, South Africa, and the Americas. Xanthium strumarium is found throughout the United States and is primarily a weed of agronomic and horticultural crops, nurseries, and occasionally pastures. Xanthium strumarium has many medicinal properties like cooling, laxative, fattening, anthelmintic, tonic, digestive, antipyretic, improves appetite, voice, complexion anodyne, Antirheumatic, appetizer, diaphoretic, diuretic, emollient and sedative. The plant is considered to be useful in treating long-standing cases of malaria, rheumatism, diseased kidneys, tuberculosis and is used as an adulterant for Datura stramonium. The fruits of Xanthium strumarium has the properties like anodyne, antibacterial, antifungal, antimalarial, Antirheumatic, antispasmodic, antitussive, cytotoxic, hypoglycemic and stomachic. They are used internally in the treatment of allergic rhinitis, sinusitis, catarrh, rheumatism, rheumatoid arthritis, constipation, diarrhoea, lumbago, leprosy and pruritus. A decoction of the root has been used in the treatment of high fevers and to help a woman expel the afterbirth and a decoction of the seeds has been used in the treatment of bladder complaints by local peoples. 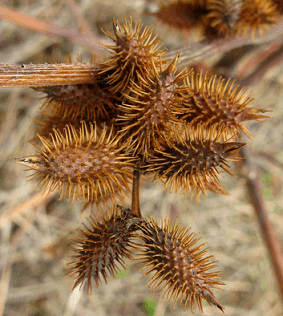 The dried leaves of Xanthium strumarium are a source of tannin. Xanthium strumarium is poisonous to grazing animals.